How far can I drive from here in 5 minutes? What areas are covered within a 3-mile drive distance of my stores? What areas are within 4 minutes of our fire stations? Creating a service area is like buffering a point. When you buffer a point, you specify a straight-line distance, and a circle is created to show the area that is within that distance. When you create a service area around a point, you also specify a distance, but unlike a buffer, it represents the maximum distance that can be traveled along a network, such as a road network. The result is a service area covering the roads that can be reached within the distance you specified. For example, the following image compares a 5-mile buffer (the dark circle) with a 5-mile service area (the lighter colored irregular shape within the buffer). 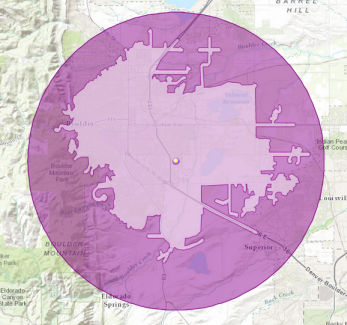 A 5-mile buffer (circle) versus a 5-mile service area (irregular shape in the circle). Service areas model the movement of people or things that move along networks. Buffers assume unimpeded movement in any direction. If you want to find the number of people within a 5-mile drive of an urgent care facility, it's better to measure the distance along roads using a service area to model the movement of potential patients. Counting the population using a straight-line buffer would overstate the count of those who could truly reach the facility within a 5-mile travel distance. The way to customize a service area is by setting properties on a service area analysis layer and setting field values on the features classes that make up the analysis layer. The following describes the service area analysis layer, its analysis properties, and its feature classes. This field stores the additional time, distance, or other travel cost for the facility. Adding a value to this field reduces the reach of the service area. If you're finding the service areas for three facilities using drive time as the cost, the field Attr_DriveTime can be used to store the amount of time spent at the facility. For example, when calculating service areas that represent fire station response times, Attr_DriveTime can store the turnout time, which is the time it takes a crew to put on the appropriate protective equipment and exit the fire station, for each fire station. Assume Fire Station 1 has a turnout time of 1 minute and Fire Station 2 has a turnout time of 3 minutes. If a 5-minute service area is calculated for both fire stations, the actual service area for Fire Station 1 would be 4 minutes (since 1 of the 5 minutes would be required as turnout time). Similarly, Fire Station 2 would have a service area of only 2 minutes from the fire station. The value you enter affects the analysis only when the [Cost] part of the field name (Attr_[Cost]) matches the cost attribute chosen for the analysis layer or travel mode. For example, if you add a 5 to Attr_DriveMinutes, but the cost attribute used in the analysis is TruckTime, the additional 5 minutes aren't included in the analysis results; however, if you change the network cost attribute to DriveMinutes, which corresponds with Attr_DriveMinutes, the 5 minutes you entered are added to the results. You can store different polygon break values for each service area facility in the Breaks_[Cost] field. Given two facilities, this means you can generate 5- and 10-minute service area polygons for one facility and 6-, 9-, and 12-minute polygons for another facility. The value specified in the Breaks_[Cost] field overrides the Cutoffs analysis layer setting. If no value for the Breaks_[Cost] field is specified, service area polygons are generated for the facility based on the Cutoffs setting. Together, these properties describe the point on the network where the object is located. The CurbApproach field specifies the direction a vehicle may arrive at and depart from the facility. If the curb approach is confined to one side of the vehicle, it could further limit the reach of the service area. Either side of vehicle (0)—The service area can begin or end at the facility such that the facility is on the right or left side of the vehicle. Right side of vehicle (1)—The service area can begin or end at the facility such that the facility is on the right side of the vehicle. Left side of vehicle (2)—The service area can begin or end at the facility such that the facility is on the left side of the vehicle. No U-Turn (3)—For service areas, this option functions the same as Either side of vehicle. OK (0)—The facility is valid. Not located (1)—The facility's location on the network dataset can't be determined. Network element not located (2)—The network element identified by the facility's network location fields can't be found. This can occur when a network element where the facility should be was deleted, and the network location was not recalculated. Element not traversable (3)—The network element that the facility is on is not traversable. This can occur when the network element is restricted by a restriction attribute. Invalid field values (4)—One or more of the facility's field values fall outside the service area analysis layer's coded or range domains. For example, a negative number may exist where positive numbers are required. Not reached (5)—The facility can't be reached by the solver. Not located on closest (7)—The closest network location to the facility is not traversable because of a restriction or barrier, so the facility has been located on the closest traversable network feature instead. The Polygons feature class stores the resultant service area polygons, which cover the areas of the network that can be reached within the given time, distance, or other travel-cost cutoff. This feature class doesn't provide any inputs to the analysis layer—it stores output information only. To generate the Polygons feature class, on the Service Area tab, in the Output Geometry group, set Output Shape Type to Polygons or Polygons and Lines . The geometry of the polygon, which is stored internally. The name of the service area polygon is based on the name of the associated facility and the cutoff range; for instance, Headquarters : 0.0 – 5.0 would represent a polygon that covers all traversable edges within 5 minutes from the facility, Headquarters. The unique ID of the associated facility. The lower bound of the polygon's break range. The upper bound of the polygon's break range. The Lines feature class stores the resultant service areas as linear features and covers the streets, or network edges, that can be reached within the given time, distance, or other travel-cost cutoff. Lines are a truer representation of a service area than polygons since service area analyses are based on measurements along the network lines. The Lines feature class doesn't provide any inputs to the analysis layer; it serves to store outputs only. Service area lines are not generated by default during a service area analysis, but you can choose to generate them. On the Service Area tab, in the Output Geometry group, set Output Shape Type to Lines or Polygons and Lines . The geometry of the line, which is stored internally. This field contains the cumulative cost of the path from the facility to the beginning of the line feature. The cost of the adjacent junction at the beginning of the line is included in this value. This field is generated for the cost attribute and any accumulation attributes. This field contains the cumulative cost of the path from the facility to the end of the line feature. The cost of the adjacent junction at the end of the line is excluded from this value. This field is generated for the cost attribute and any accumulation attributes. Each service area line traverses a feature from a network source feature class—a feature class used to create the network dataset on which the service area analysis is performed. This field specifies the unique ID of the source feature class the traversed feature is a part of. The ObjectID of the underlying source feature that is traversed by the service area. Specifies where along the underlying source feature the service area line begins. A value of 0 (zero) indicates the service area line begins at the from-point of the underlying source feature. A value of 1 indicates the service area line begins at the to-point of the source feature. A value between 0 and 1 indicates the line begins at a point along the underlying source feature; for example, a value of 0.25 means the line begins 25 percent along the digitized direction of the underlying source feature. Specifies where along the underlying source feature the service area line ends. A value of 0 (zero) indicates the service area line ends at the from-point of the underlying source feature. A value of 1 indicates the service area line ends at the to-point of the source feature. A value between 0 and 1 indicates the line ends at a point along the underlying source feature; for example, a value of 0.25 means the line ends 25 percent along the digitized direction of the underlying source feature. The following subsections list properties you can set on the analysis layer. They are on the Service Area tab, which is available only if your service area layer or one of its sublayers is selected in the Contents pane. Run is in the Analysis group. Click it, after you load input features and set analysis properties, to solve the service area analysis. Import Facilities is in the Input Data group. Click it to load features from another data source, such as a point feature layer, into the Facilities feature class. Import Barriers is in the Input Data group. Click it to load features from another data source, such as another feature layer, into one of the barriers feature classes (point barriers, line barriers, polygon barriers). The Mode drop-down list lets you choose a travel mode, which is a group of settings that together model the movement of pedestrians, cars, trucks, or other travel mode. The choices available in the drop-down list depend on the travel modes that are configured on the network data source that the network analysis layer is referencing. Away From Facility—The service areas are measured from the facility out to the periphery. Towards Facility—The service areas are measured from the periphery in toward the facility. On a network with one-way restrictions and different travel times based on direction of travel, this would result in different service areas. The direction you should choose depends on the nature of your service area analysis. The service area for a pizza delivery store, for example, should be created for travel that spans out from the facility (Away from Facilities) since pizzas are delivered from the store to the customer. Alternatively, a hospital would choose Towards Facilities since the urgent part of the trip for a patient is going to the hospital, not returning home afterward. The Direction setting affects how Network Analyst interprets the time and date you specify in Type, Time, and Date. Away From Facility—The time and date indicate when the service area starts at the facility. If Direction is set to Towards Facility, the time and date indicate when the service area finishes at the facility. If there is any service time at a facility (that is, the facility's Attr_[Cost] field has a positive value), the service time is included in the results immediately before the finish time when travel is toward facilities, or immediately after the start time when travel is away from facilities. The extent of the service area to be calculated is specified with the Cutoffs text box. For instance, a cutoff of 10 creates service areas of 10 units (for instance, 10 minutes or 10 miles) from the facilities. The unit for the chosen travel mode is indicated to the right of the Mode drop-down list. The Cutoffs property is used when a facility's Breaks_[Cost] field value is null. Suppose you have two facilities, A and B, for which you want to find a drive-time area. Facility A has a Breaks_DriveTime value of 3. Facility B has no value for its Breaks_DriveTime field. When you find the service area with Cutoffs set to 5 (minutes), facility A will have a 3-minute service area, and facility B will have a 5-minute service area. Cutoffs assigns default values to facilities that do not have numeric values stored in the Break_[Cost] field. 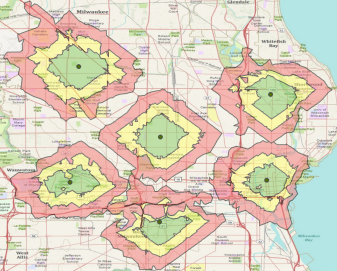 Multiple polygon breaks can be set to create concentric service areas. For instance, if you want to find 2-, 3-, and 4-minute service areas for each facility, you would type 2, 3, 4 in the Cutoffs text box. The Type drop-down list is in the Arrive/Depart Time group and is enabled when the cost units are time based. It allows you to choose how to enter a time value. The main reason for setting a specific time and date is to solve the analysis using dynamic traffic conditions, such as from live and predicted traffic flows, if your network data source incorporates that information. Not Using Time —Regardless of whether the network data source includes traffic data, the results are based on static travel times—the travel times on a street don't fluctuate throughout the day. The Time and Date text boxes are disabled. Custom Time & Date —You specify the time as a time of day and calendar date. The Time and Date text boxes are enabled for you to enter this information. Today —You specify a time and the day is assumed to be the current date. The Time text box is enabled for you to enter the time of day, and the Date text box is set to Today and is disabled so it can't be changed. Current Date & Time —When you run the analysis, the time and date are set to the current time and date. This is useful if your network data source is configured with traffic data and you need to know what areas can be reached if drivers departed now. The Time text box is set to Now, and the Date text box is set to Today; both are disabled so they can't be changed. Choose whether to generate polygons , lines , or polygons and lines as output. Line output is not available if the network data source is a portal service. You can specify the level of detail you want for output polygons by setting the Output polygon detail level property. Generalized—This option is available when your network dataset includes a hierarchy attribute. In a hierarchical service area analysis, the solver prefers higher-order edges to the lowest-order edges. This means that if a facility is located on a local road (the lowest level in a hierarchy), the solver spans out on the local roads in that area, but it tries to step up the hierarchy to secondary and primary roads. 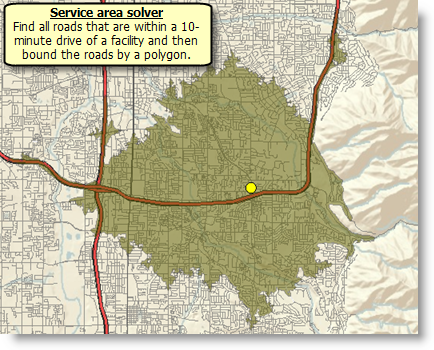 Once on secondary and primary roads, the solver ignores local roads throughout the rest of the service area. It ignores secondary and local roads once it has stepped up to primary roads. Mainly because of this hierarchical approach, nonhierarchical service areas tend to be superior in quality to their hierarchical counterparts. Standard Precision—Standard polygons are generated quickly and are fairly accurate, but quality deteriorates somewhat as you move toward the borders of the service area polygons. Outputting standard-detail polygons may result in islands of unreached network elements, such as roads, being covered. High Precision—Choose this option to get the most detailed polygons. Holes within the polygon may exist; they represent islands of network elements that couldn't be reached without exceeding the cutoff impedance or due to travel restrictions. Expect high-precision polygons to take the longest amount of time to generate. You will get holes only if you use High Precision polygons and the Overlap or Dissolve output geometry setting. The Split setting will not generate holes within the polygons. Creating a service-area index on your network dataset can optimize processing time and improve the quality of standard- and high-precision polygons. Overlap—This option creates individual polygons for each facility. The polygons can overlap each other. For overlapping lines, portions of the network that are within reach of more than one facility will have a line for each facility. Dissolve—This option merges the polygons of multiple facilities that have the same cutoff values into one polygon. If the polygons of a given break value don't touch, they are nonetheless merged into one multipart polygon. This option does not apply to lines. Split—This option creates individual polygons that are closest for each facility. The polygons do not overlap each other. For split lines, none of the lines overlap each other, and a line is always assigned to the nearest facility even if more than one facility can reach it. 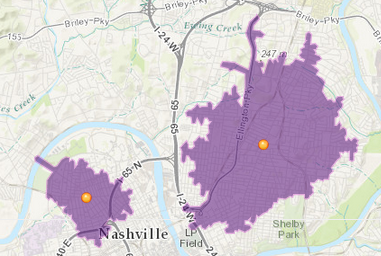 You can choose to create concentric service area polygons as disks or rings. Rings—Output polygons extend between the nearest cutoff values only. They do not include the area of smaller breaks. This creates polygons between consecutive breaks. Disks—Output polygons extend from the facility to the cutoff. If you create 5- and 10-minute service areas, the 10-minute service area polygon will include the area under the 5-minute service area polygon as well as the area from the 5-minute to the 10-minute break.